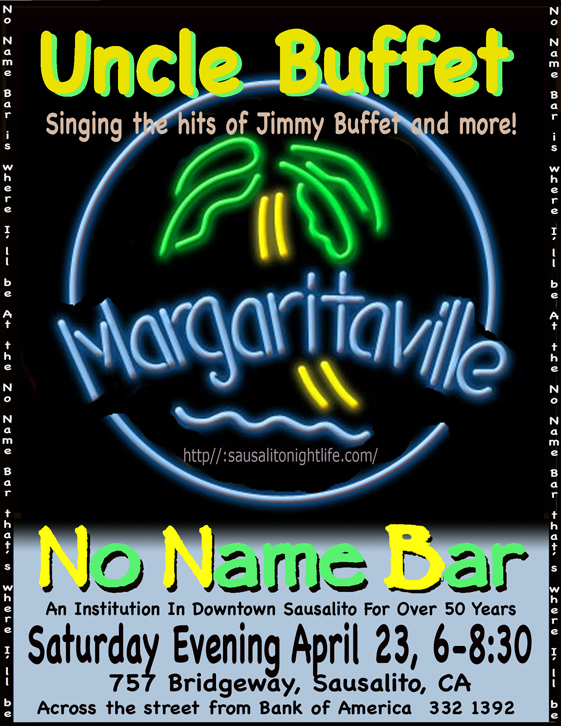 Another fun night of jamming at the Sausalito Cruising Club was had with at least 25 musicians who came to sit in. Every one got a chance to play though. How this was done follows. 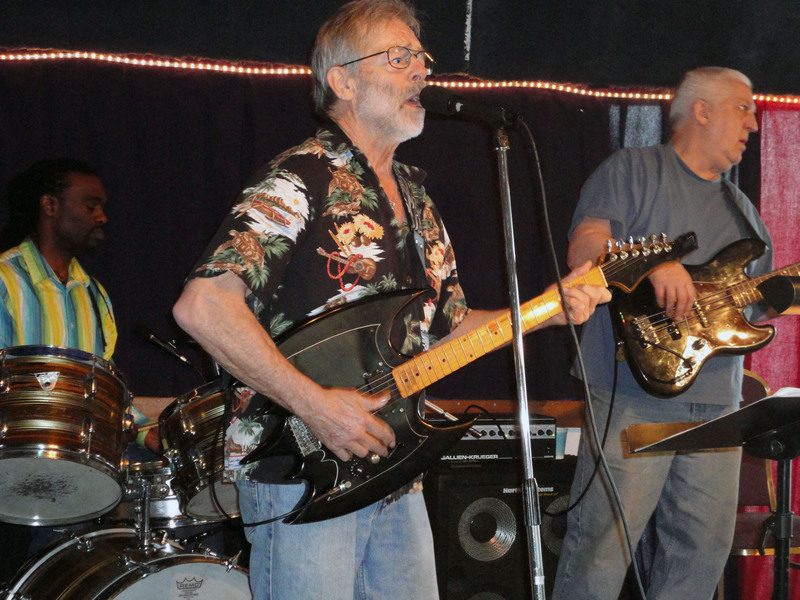 After a 40 minute set by the house band, Donny Kountz, Wille Riser and Joe Tate, the first jammers were brought up in organized groups. Starting with John “Coyote” Egan, who brought some of his students and other cohorts, the music was well arranged in spite of the “jam session” thing. Coyote is backed by Travis Yee on guitar, Robert Hobart on guitar, Don Nguyen on bass and Andy on drums. Coyote has a bunch of original bluesy songs that all these guys know, so it’s good for them to all come up together. Coyote lays down a nice Albert King kind of blues but his student Travis is a smokin’ hot youngster and Coyote uses him to good advantage. Next up was another rehearsed group playing under the leadership of Gary Berger. 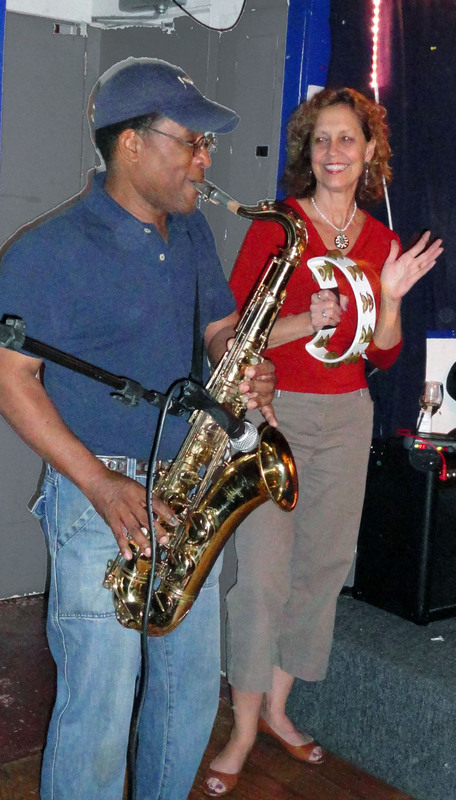 Anthony Lincoln was an exciting singer and he doubled on saxophone. 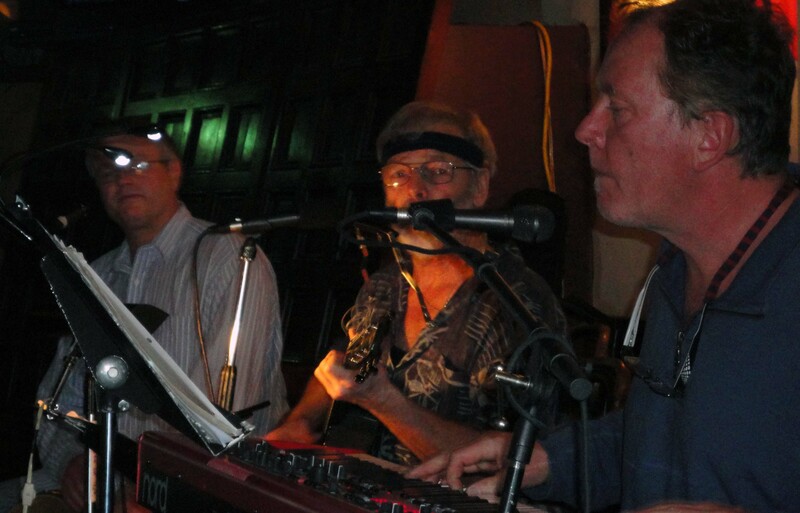 In addition, this lineup had Ron Lando on guitar, Mike Adams on drums, Don Nguyen on bass and of course Gary Berger on piano. 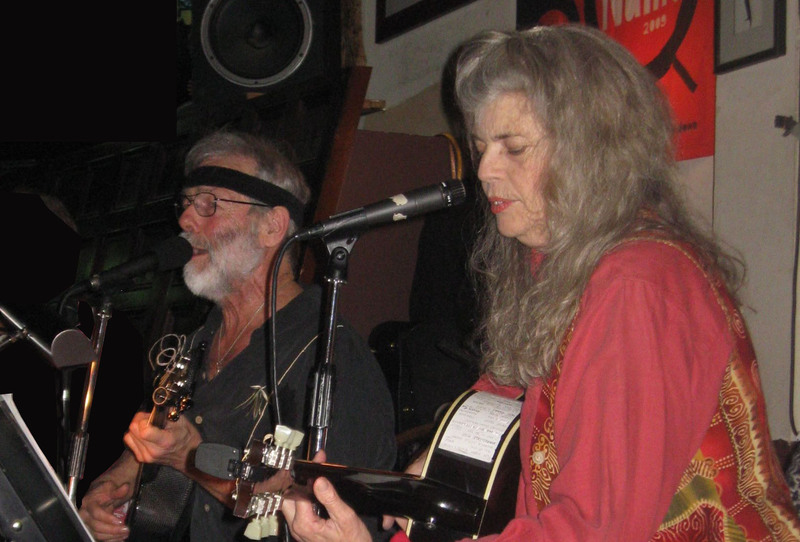 Bonnie Hofkin and Ken Markowitz assisted on harmonica and guitar as was needed. This group had a lot of torque and this made people dance. They did a few familiar rock and blues numbers while changing the lineup here and there. There was some pressure to get more of the waiting players up but this played out peacefully with only minor hurt feelings. “Little” Mike Adams drifted from group to group all night which only makes sense because there was a shortage of drummers. 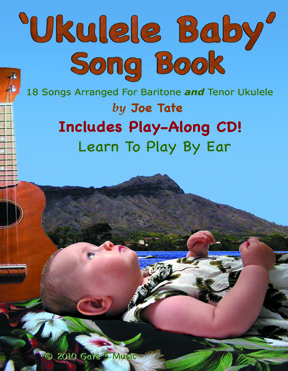 There were plenty of guitars though which made it easy on Joe Tate who only had to manage all the others who wanted to play. 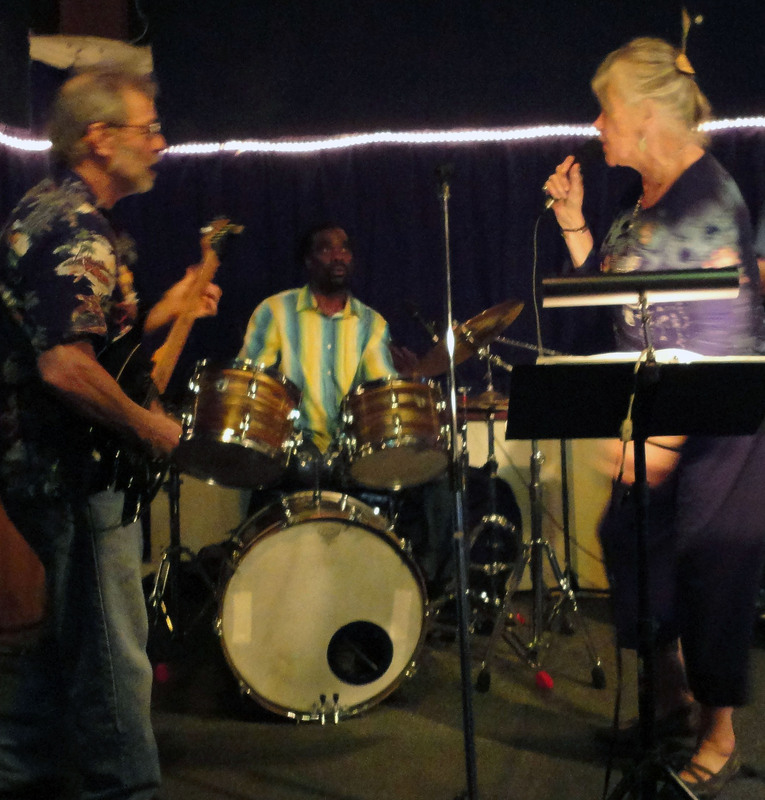 Another interesting group on this night was the “Freewheelers.” Fronted by Ilene Vossen, who rocks out on cello, she is backed by Buzz Vossen on bass and Bonnie Hofkin on harmonica. 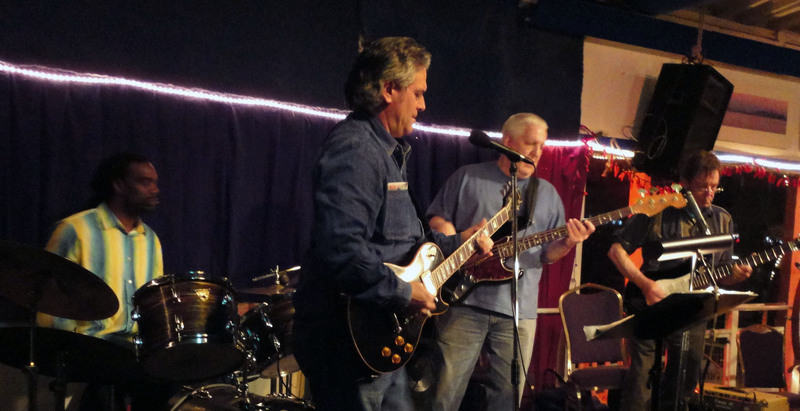 With house drummer Donny Kountz and guitarist Gabe Navarre, they have a solid beat and got it on right away with stuff like Route 66. Ilene delivers some really nice solos on what is usually thought of as a classical instrument. What matter though, the sound was new and different and we need some of this stuff just for comic relief from all the serious themes that are carried by the blues. Throughout much the evening there was some wailing sax coming from the corner of the stage where Anthony Lincoln was hanging with his ax. 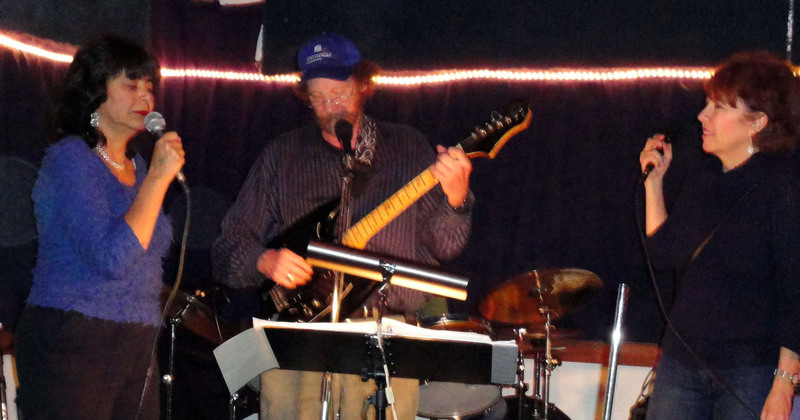 There were also some harmonicas working the edge of the room including Scott Sherman and Tom Barr in addition to Hofkin who worked the stage. They had their own amplifiers set up so they would chime in whenever asked. Tate had all three harmonicas blowing at once sometimes. This might have been in poor taste but it was fun. There was also a performance by “Daylight Again,” a tight harmony trio consisting of Sana Hoffer, David Kemp and Gloria Lopez. 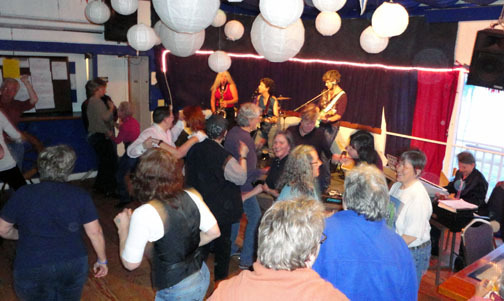 They really lit up the Cruising Club with Ooh Baby Baby, from Crosby Stills and Nash. This was paired up with Have Mercy, a song made famous by Loretta Lynn. 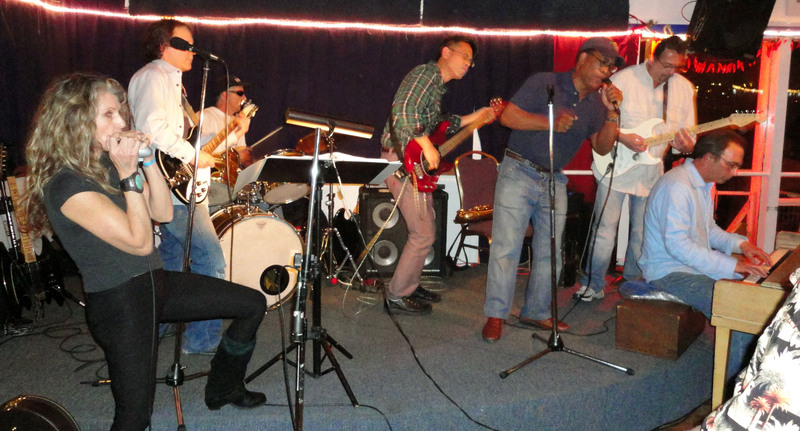 They were backed by house band members Donny Kountz on drums and Willie Riser on Bass. 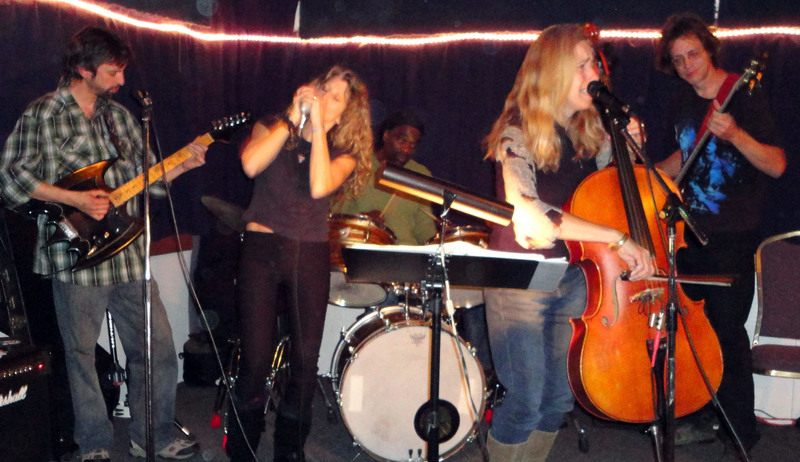 Sana Hoffer also sang solo on Better Off With The Blues, the Delbert McClinton swamp blues hit. 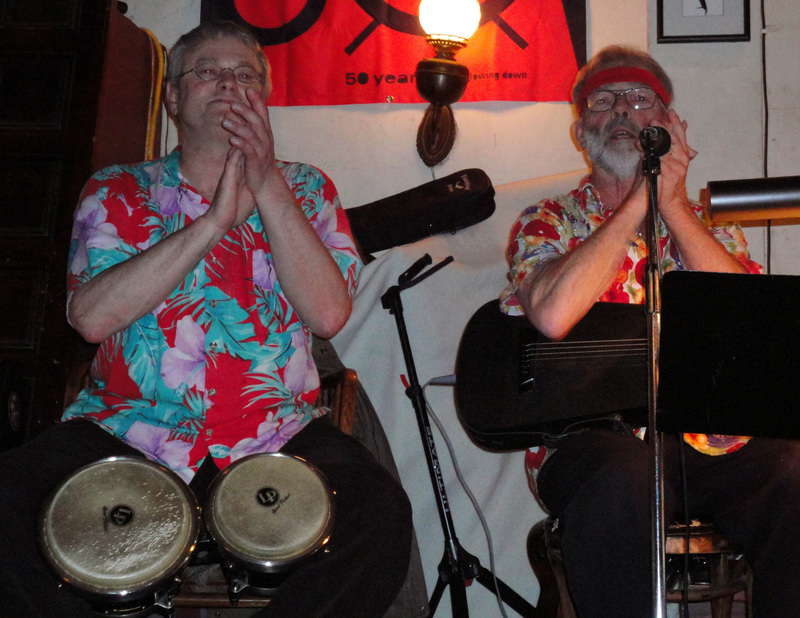 All the jammers made it a great evening and thanks is given here to others who played and sang including Suzie Olsen vocals,Ron Rosano drums, Charlie on guitar and Paul Bohan guitar. 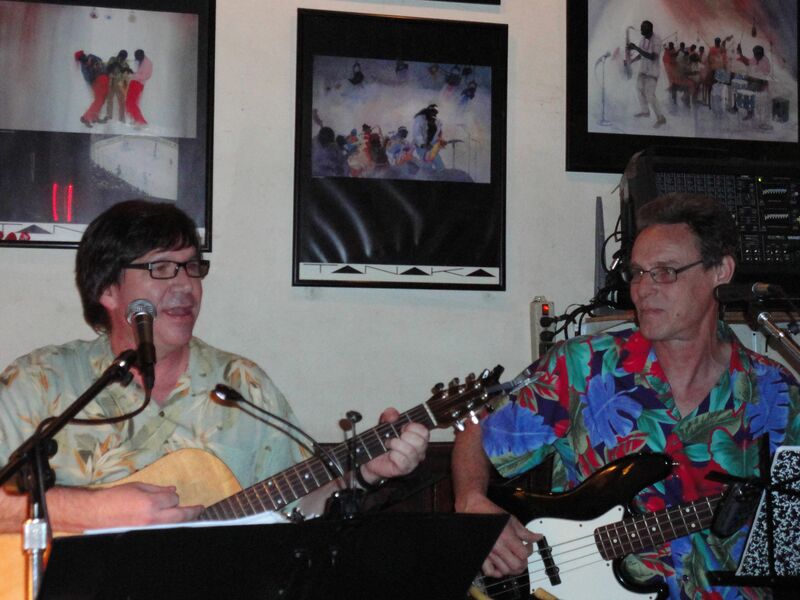 The next Blue Monday Jam session will be on April 11 starting at 7 PM. Bring you instrument and enjoy the buffet dinner for just $5. Every once in a while you encounter a band that is dripping with happiness. I don’t mean in a forced smile kind of Hollywood phony thing but people who exude the stuff. That’s the Average Dyke Band. And that goes for their audience too. They are all having so much fun, dancing and prancing and loving each other. A feeling of merriment pervades. What can be said about this Motown-Rhythm and Blues machine on the stage though? They start rockin’ the house right away, churning through Heat Wave, I Heard it Through The Grapevine, What’d I Say and Chain Of Fools. Everyone headed for the dance floor and stayed there for most of the set. These girls can dance too. It looks as if many of these couples have practiced a lot and their moves are graceful and coordinated. 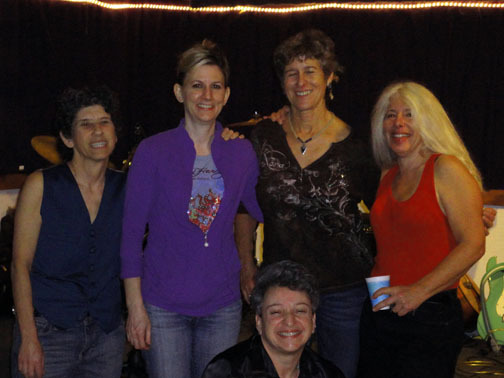 The Average Dyke Band consists of Stephanie Teel on guitar and vocals, Carrie Gerendasy on bass and vocals, Robin Roth on drums, Rosa Koire on saxophone and Sheri Kline on keyboards. 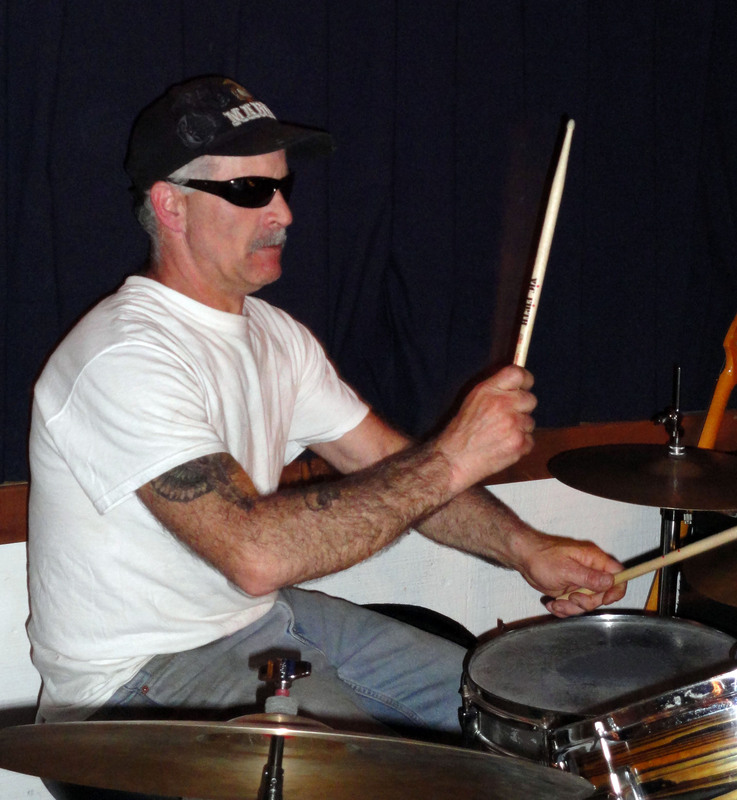 They have been together for about six years except for Stephanie Teel, who joined the band last december. According to Ms. Gerendasy, they have been employed “mostly at prides and stuff” plus many private parties. 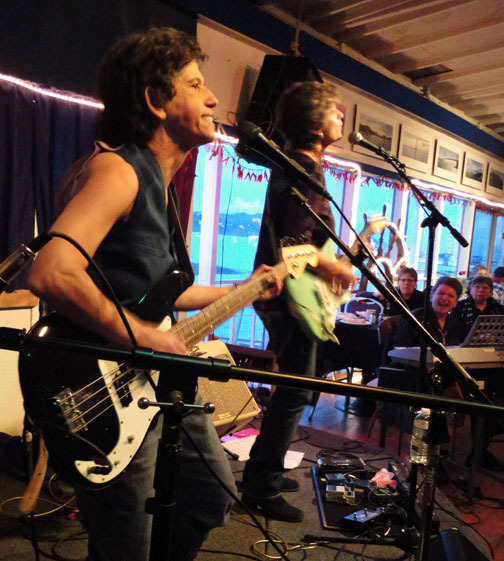 Stephanie has her own “Stephanie Teel Band” and they regularly appear at the Sausalito Cruising Club and the Sausalito Seahorse. 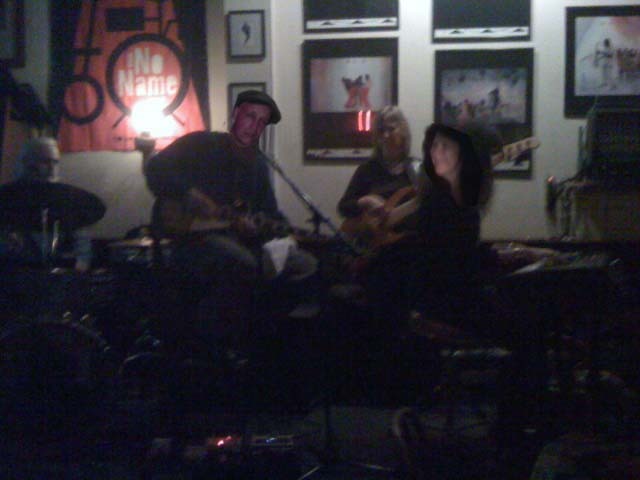 Stephanie often shows up at the Monday night jam sessions and shows the big boys how to handle a guitar. This woman always gets it on. Anyway, after the break, they came back with something like Rockin, Rockin, Rockin, which must be an original song. 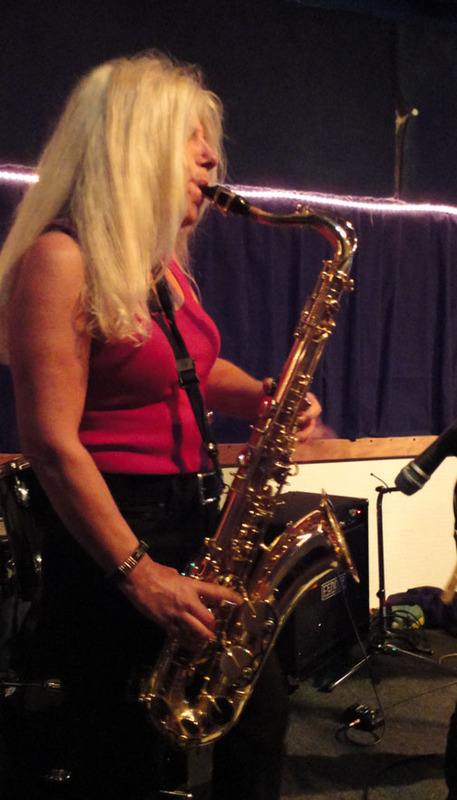 Nobody knew the title but it had a great sax solo played by Rosa Koire and, of course, the dance floor was full again. 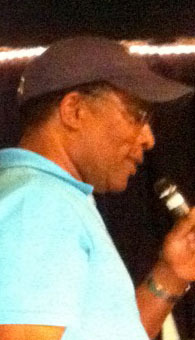 Teel had a great vocal on Runaway, the Del Shannon classic. The organ solo, played by Sheri Kline was magnificent. Then it was somebody’s birthday and they cranked out the Beatles I Know it’s Your Birthday or whatever the title is. 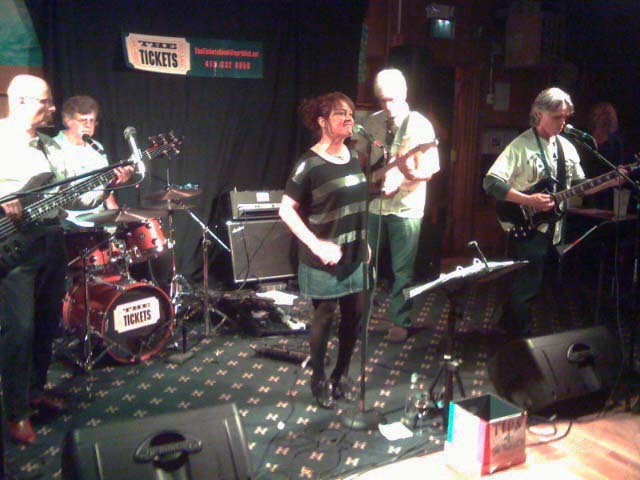 Then they just kept gettin’ down with Motown, funk, soul and some more good old rock n’ roll. It was a really fun evening here hopefully there will be other chances to hear these folks. Doors at 8 pm Show at 8:30-12:30.